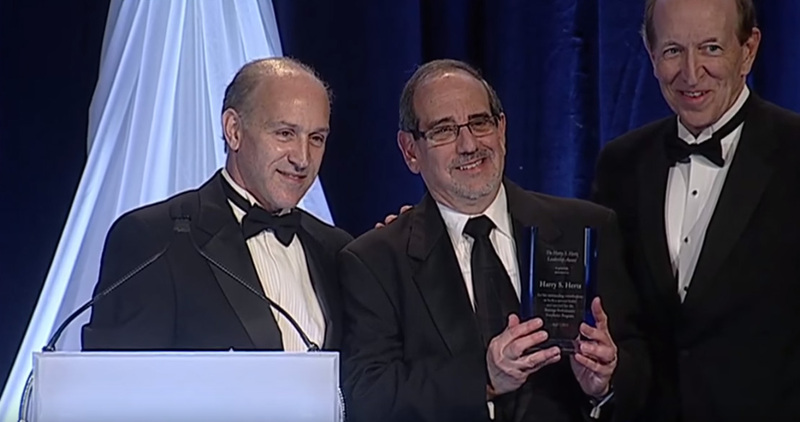 Kenneth R Cohen, PhD, The Synergy Organization Founder & CEO, presenting Harry S. Hertz, PhD the inaugural Harry S. Hertz Leadership Award. Synergy recognizes that the critical components of any extraordinary organization are the quality as well as the continuity of the leaders. Dr. Harry S. Hertz, PhD receives the first annual Harry S. Hertz Leadership Award from Dr. George Benson PhD, Baldrige Foundation’s Chair, and Kenneth R. Cohen, PhD, Founder and CEO of The Synergy Organization. Synergy has demonstrated its own longstanding commitment to “giving back” to the healthcare industry and to identifying and recognizing the best leaders by creating the Harry S. Hertz Leadership Award in collaboration with the Baldrige Foundation. This prestigious award also seeks to ensure the long-term success of the Baldrige Performance Excellence Program. Harry S. Hertz Leadership Award announced by Dr. George Benson, Chair of the Foundation for the Malcolm Baldrige National Quality Award and Dr. Kenneth R. Cohen, CEO for The Synergy Organization, an evidence-based executive search firm. On April 7, 2013, during the 25th Gala celebration to honor the Baldrige Performance Excellence Program’s first quarter century, Dr. Hertz was presented with the first Harry S. Hertz Leadership Award.